I sometimes find myself channel surfing late at night. 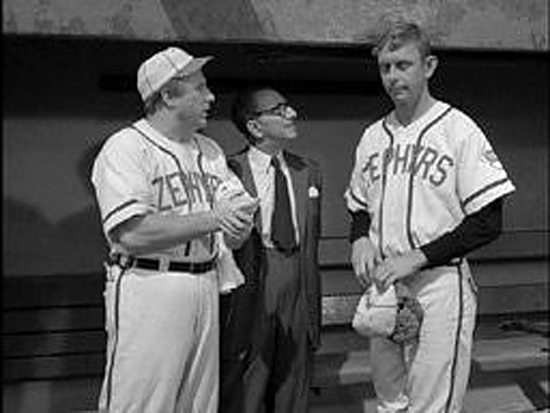 I flipped to an old Twilight Zone episode where the Hoboken Zephyrs had a robot pitcher named Casey. It was hokey, but I hadn’t seen it in awhile and it made me think, “I wonder what baseball will be like in the future.” I didn’t want to look five years, or 10 years into the future. Why not make it interesting and jump ahead 20 years into the future. Now I’m certainly not Nostradamus or even Bob Costas, for that matter, but I grew up with baseball and feel qualified to make an informed hypothesis as to the future of the game. Remember the Twilight Zone episode where the robot pitcher dominated the league? Will we ever see a robo-player? Will baseball even be considered America’s game in 2030? Maybe not with increased competition from the NFL, but it just takes one good labor dispute by any league to completely turn off the fans and it looks like the NFL is heading for one soon. So there is hope for baseball and as long as fathers go out to have a catch with their kids, it will be a part of American culture. 9. More International Play – I really enjoy the World Baseball Classic, but when I go to the games, I wonder where the heck everyone is. I’ve been to high school football games with more fans. Maybe the game is just better suited for television and overseas, but it is clear that MLB is focused on growing its game internationally. With more and more players from Latin America coming into the league, there is definite potential to have a franchise south of the border. In 2030, I believe there will be a franchise in Mexico City, Ole! The financials will be tough to work out, but Spanish-speaking players and fans in Mexico would eat it up. I can also foresee that a spring training league may be set up in Japan. At the very least, the early regular season games in Japan will likely continue with some added to China as well. The Asian community is passionate about baseball and are begging for more. 8. Pitch Clock – No, I’m not talking about how many pitches a pitcher throws, I’m talking about how long it takes them to throw a pitch after getting it back from the catcher. That’s right, put them on the clock. If you don’t get the pitch off within 45 seconds from having it in your glove, that’s an automatic ball. Hey, that’s how we do it in 2030! Long overdue if you ask me. 7. 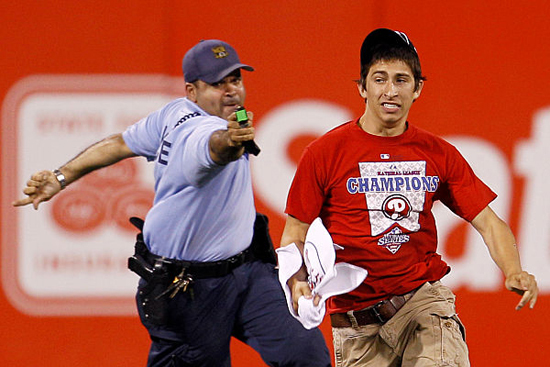 Less “Fan” Interaction at the Stadium – Fans are great for the game of baseball, but remember, fan is short for “fanatic.” Fans have the potential to go a little crazy. Streaking, pouring beers on players, shouting profanity or even running onto the field to attack coaches are all actions of fanatics. I read the story about a fanatic in Philly intentionally vomiting on a father and daughter. Are you kidding me? Even players can be fanatics, just look at Milton Bradley. And while these crazy outbursts are rare, when they do happen it triggers a very strong response from MLB and the MLBPA. One of the great things about going to the ballpark is having the ability to be so close to the players, but unfortunately in the next 20 years, I’m pretty sure a small group of fanatics will do something idiotic that requires additional security at the gate and more security between players and the fans at the ballpark. I’m not talking about trenches and moats, but higher walls, more space between the stands and field and of course more security staff on the field are all likely on the horizon for baseball’s future. Will fanatics ruin the game for everyone? Looks like he's thinking, "Maybe this wasn't the best idea..."
6. The Billion Dollar Player – Move over Alex Rodriguez, the billion dollar player is coming. No, maybe not in five or 10 years, but in 15 to 20 years it could definitely happen. Tickets will probably be $500 a game by then anyway so don’t say it can’t happen. Sooner or later they will accept your apology Pete. Hang in there. 4. 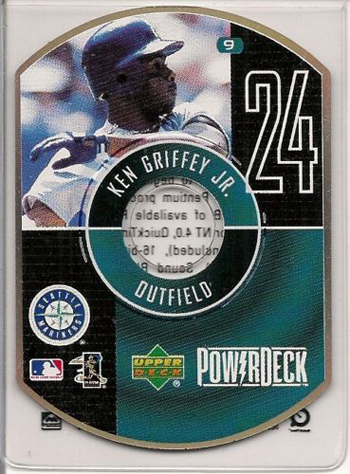 Baseball Cards Go Digital – Always leading the way with innovation, Upper Deck brought a digital trading card to the market back in 2000 with PowerDeck, but it was ahead of its time and collectors didn’t embrace it. Twenty years in the future, I believe a strong segment of baseball cards will move to a completely digital experience with better results from fans where users can play games, interact with players and win prizes through cards that are digitally traded with computers, cell phones and whatever else comes next. 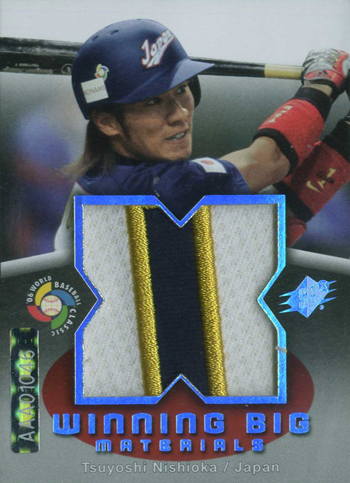 The physical trading cards will never go away and Upper Deck is working on some remarkable new technologies currently to really blow collectors’ minds. It blows my mind to think about what the physical cards will look like in 20 years when we are already planning some amazing new insert card sets in next couple years. It’s going to be a lot of fun. The digital trading card has been done, what's next? 3. Unbelievable New Stadiums – The new Yankee Stadium and Citi Field have set the stage for new mega-stadiums in major markets. Unfortunately, out with the old and in with the new in some cases. I think in order to remain competitive with New York, Boston will have a new Fenway Park 20 years from now. I also think a new Dodger Stadium (along with a powerful new Dodgers owner) are not that far off. I can’t see Wrigley Field getting demolished in the next 20 years, however. While both Wrigley and Fenway are considered cathedrals for baseball, the Chicago faithful would riot for months if the wrecking ball came close to West Addison. Boston fans love Fenway too, but if it meant putting a better product on the field and competing with the hated Yankees, I think they’ll be more apt to do it. 2. 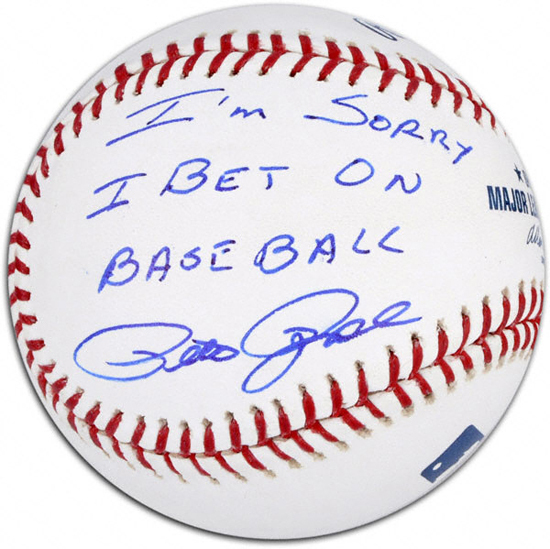 A Major Record Will Fall – I think over the next 20 years we will see Joe DiMaggio’s 56-game hit streak record fall. It’s one of the most impressive personal records ever, but players have come close before and it’s one of the few major records of meaning that a player would want to shoot for. And I don’t know when this blitz of no-hitters and perfect games is going to stop. The next few years may continue to see pitching dominance, but after that, look out Joltin’ Joe. 1. Instant Replay and Challenges – We’ll see this not just for home runs and foul balls as we do today, but replay will extend to catches and questionable calls on the bases with the opportunity for managers to challenge umpires’ calls. I don’t think you can ever take balls and strikes away from the umpires, however. Although tennis in particular incorporates technology to tell if a ball is in or out, calling balls and strikes is part of the game that I just can’t see ever being taken away from the umpires. "I object!" 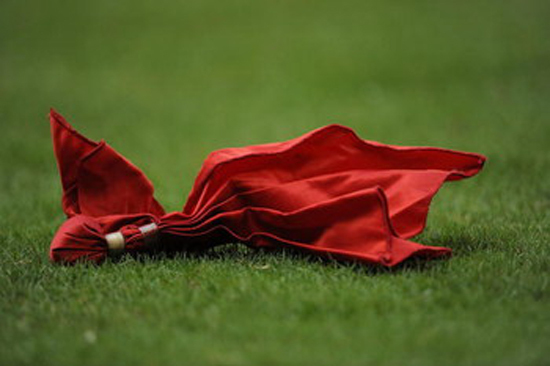 How much does Armando Galarraga wish there was a challenge flag in baseball to save his perfect game? Do these sound fair or foul? What do you think the future holds for baseball 20 years from now? I feel that baseball will continue to evolve in much the same way it has for the last 130+ years.. Slowly but surely. 1. The DH rule. I feel the next major baseball change will either be the abolishment or the full adaptation of the dh rule for both leagues. This one or the other is nonsensical! 3. Umpires, replay and challenges. Baseball and umpires decisions have been interlinked for its history. I see no change coming anytime soon nor reason to change. After all who would Cardinals fans have to blame for losing the 85 world series if Don Denkinger wasnt Umping 1st base! 4. MLB LICENSED Trading cards. To save on trees Upper Deck should be awarded the exclusive for MLB and be required to issue cards as CD/DVDs and holographic metal foil cards that are completely green, completely counterfeit proof and always grade out to a perfect 10! Thank you Chris for a very Insightful glimpse to our future! Please take care of Item 4 Immediately instead of not so near distant future OK!